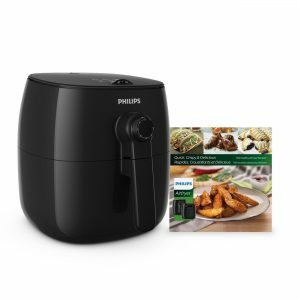 Black Philips Viva TurboStar FFP HD9621/99 is the next generation modern air fryer to let you air fry a variety of ingredients with much less or zero fat. A cookbook of more than 150 great recipes for dinner, breakfast, dessert etc. is included as a bonus. The TurboStar technology that is unique to this Philips AirFryer swirls and circulates the hot air constantly and continuously inside the cooking area. And your ingredients in the QuickClean basket are cooked quickly and thoroughly, maintaining a juicy and tender interior and crispy exterior with the fat being drained into the drip tray underneath. So you have a healthier and lower calorie fried, baked, grilled or roasted meals without the excess fat but with exactly the same taste and texture of deep fried. As an analog unit it is very easy to operate with only two dials to worry about: One at the top for temperature in Fahrenheit (180 to 390 degrees) and one at the front for the timer which you can set it between zero to 30 minutes. TurboStar is a very efficient system and it will get hot inside very quickly and will start cooking your meal. What this means is there is no preheating needed like with regular ovens. And this way you will save both on energy bills and time, with also the much shorter cooking time than normal. Philips HD9621 looks nice in black, weighs 15.08 pounds and measures 13.6 x 13.6 x 14.1 inches. It has a 1.8lb. 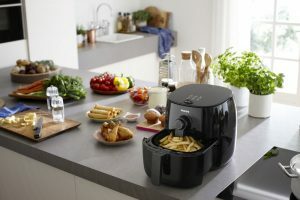 or 3 quarts capacity (able to cook up to four servings) but is 4/5th of the previous model Philips 9220 Airfryer, so you can have it permanently on your countertop without taking up too much space. You just need to use a tablespoon of oil or less for a full basket to get very tasty meals with great texture- golden brown crispy on the outside and juicy and yummy inside without any fat of the deep fried at all. You will not need to turn the ingredients over in the middle of cooking like you may have to with some other models. The QuickClean basket includes a detachable non-stick mesh (stainless steel with Teflon coating) that makes it very easy and quick to clean. And both the cooking basket and the nonstick coated drawer. Unlike some of the other models the handle on this one is the easy-click variety, so you can lock and unlock easily for putting ingredients in, taking your meal out, cleaning and storing purposes. As a new product, Philips Viva HD9621 doesn’t have that many customer reviews yet but is rated 5 stars at the moment. According to Euromonitor International Ltd, Philips is the leading- number 1 low-fat fryer brand globally, in terms of retail volume sales. It costs a bit more than some of the other air fryers we reviewed so far but is sure to do a better job and to last more. We think that the price is fair for a such a high quality, durable and functional cooking product.